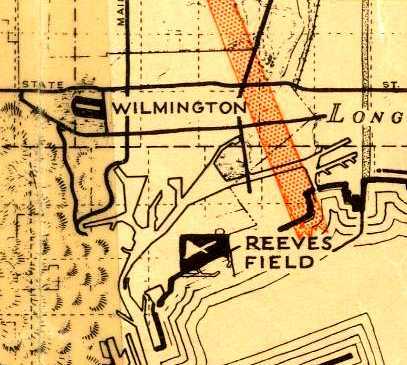 Wilmington Airport, as depicted on a 1938 street map (courtesy of Kevin Walsh). was operating sightseeing rides in his J-3 Piper Cub on floats off the beach at Cabrillo. My father, Thomas 'Hilton' Tupman, being a pilot, would often see the seaplane when leaving the harbor for family trips to Catalina. and build a small seaplane-accessible airport at the top of what was once called the Bixby Slough. 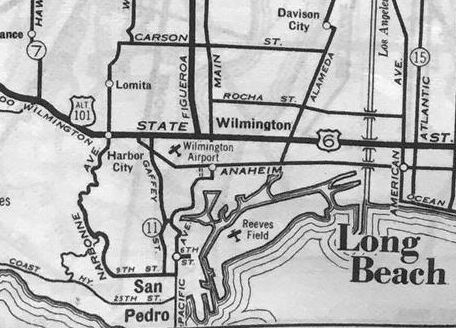 The earliest depiction which has been located of Wilmington Airport was on a 1938 street map (courtesy of Kevin Walsh). as that is how it was labeled on the January 1938 LA Sectional Chart. 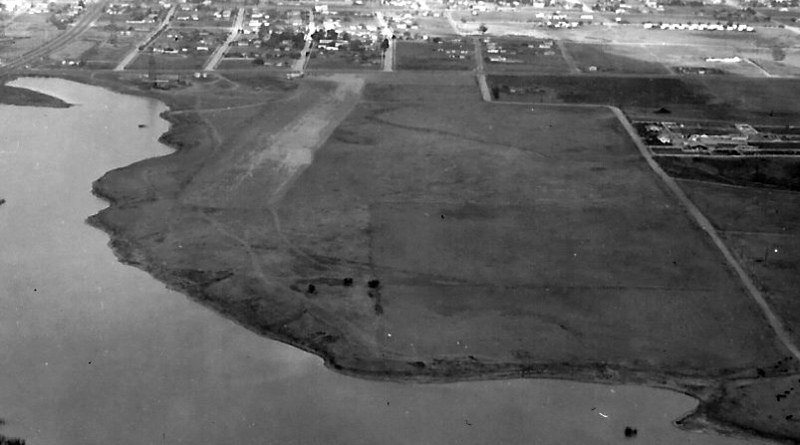 A circa 1938-41 aerial view of Bixby Slough (courtesy of Buzz Tupman), showing the location of Los Angeles Harbor Airport. Buzz observed, “Pacific Coast Highway in the left lower corner, and Figueroa on the left upper corner. 1 Taylorcraft on floats, 3 Interstate Cadets on wheels, and 1 Piper Cruiser. The airport operated a flight school & rental business for both land and water aircraft, as well as tie-down space for a dozen or so aircraft. 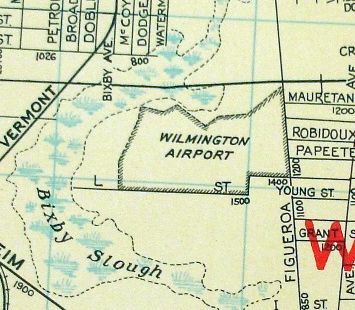 A 1940s street map depicted Wilmington Airport as an irregularly-shaped property outline in between Bixby Slough & Figueroa. 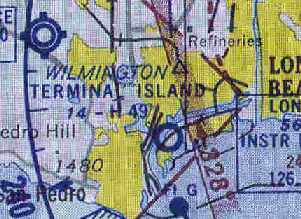 The October 1941 LA Sectional Chart depicted Wilmington as a commercial/municipal airport. 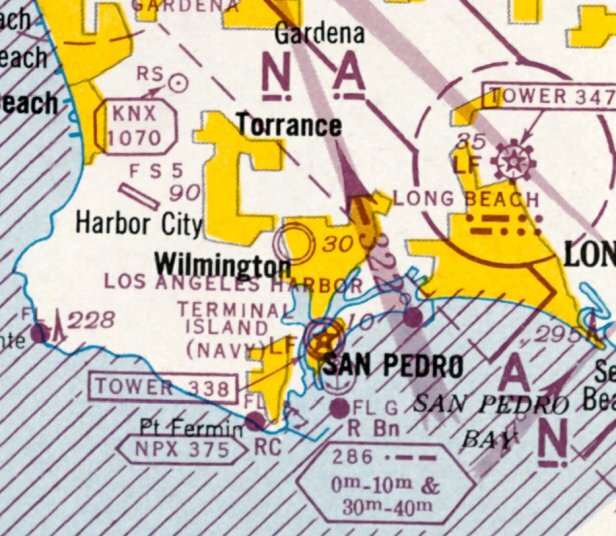 The October 1941 LA Sectional Chart depicted Los Angeles Harbor Airport as a military airfield. 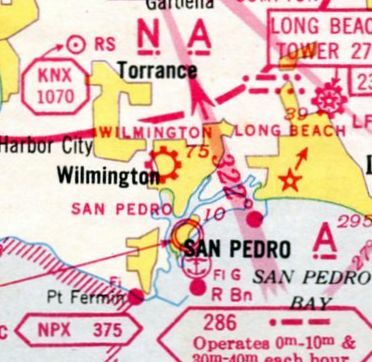 No airport was depicted in Wilmington on the August 1945 LA Sectional Chart nor on the 1947 LA Local Aeronautical Chart (courtesy of Tim Zukas). as it was an advertiser in the 1949 Banning High School Yearbook (courtesy of Chris Rubacha). 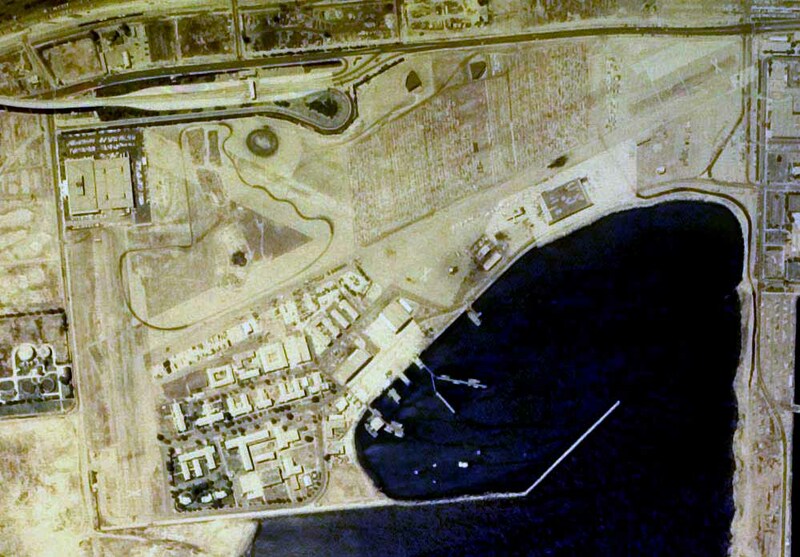 A 2013 aerial photo shows no trace of the former Los Angeles Harbor Airport. 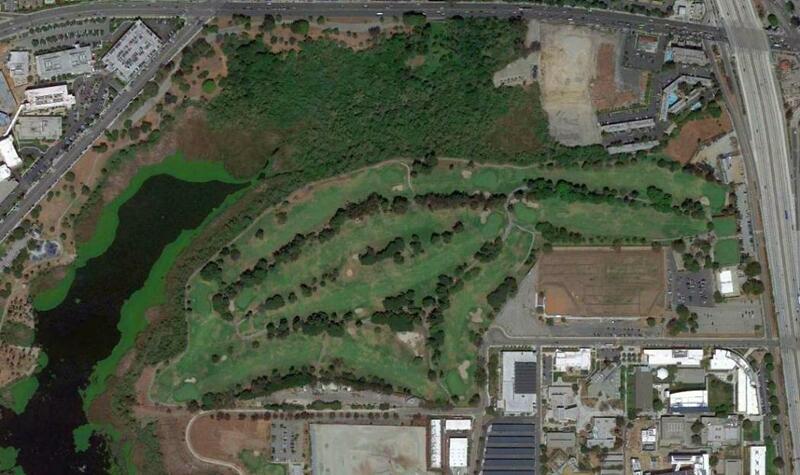 Recent street maps label the site of Bixby Slough as Machado Lake, and the site of Los Angeles Harbor Airport as Harbor Park Golf Course. Thanks to Buzz Tupman for pointing out this airfield. 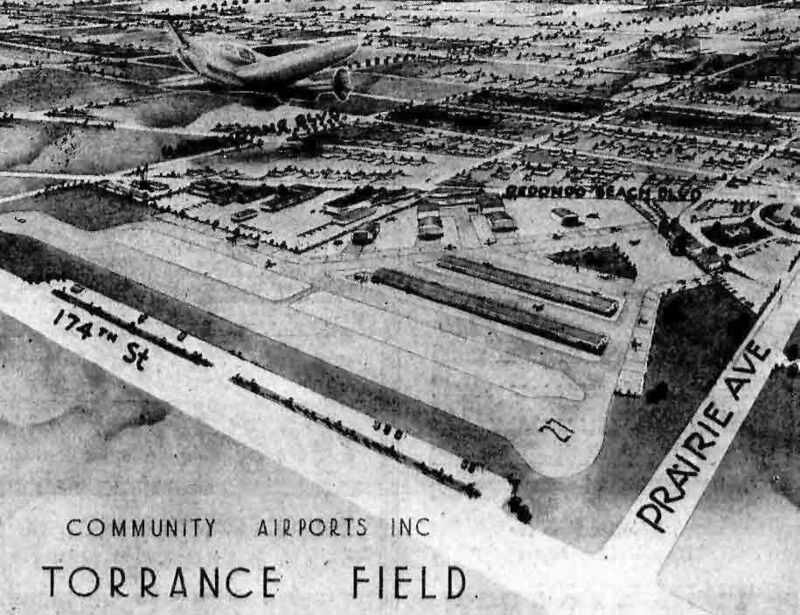 An artist's conception of Torrance Field from the 5/30/46 Torrance Herald (courtesy of John King). that would address the proposal brought forth by Ray Walker of Community Airports Inc.
for a 'Flying Field' to be located at the west end of the former McDonald Tract. Representatives from the City of Torrance Planning Commission were on hand to discuss the issue. prior to the selection of the eventual site just west of Alondra Park. from the 5/30/46 Torrance Herald (courtesy of John King). The caption read, “North Torrance Airport opening set. June 1 will see the new Torrance Airport of Community Airports Inc., headed by Col. W.J. Fox, opened for operations. Above is an artist's conception of the completed airport as proposed. Two 2,300' runways & taxiways already are paved. 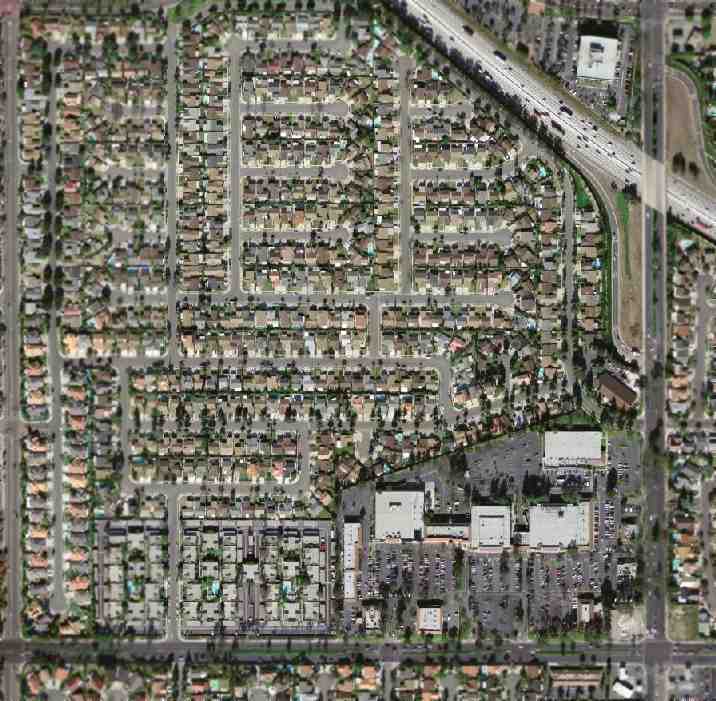 along 174th Street & at the intersection of Redondo Beach Boulevard & Prairie Avenue. gasoline pits for servicing planes, wash ramps, and plane parking (tiedown) areas as indicated. and that it would also be 10 years ahead of its time in 'airdrome engineering'. 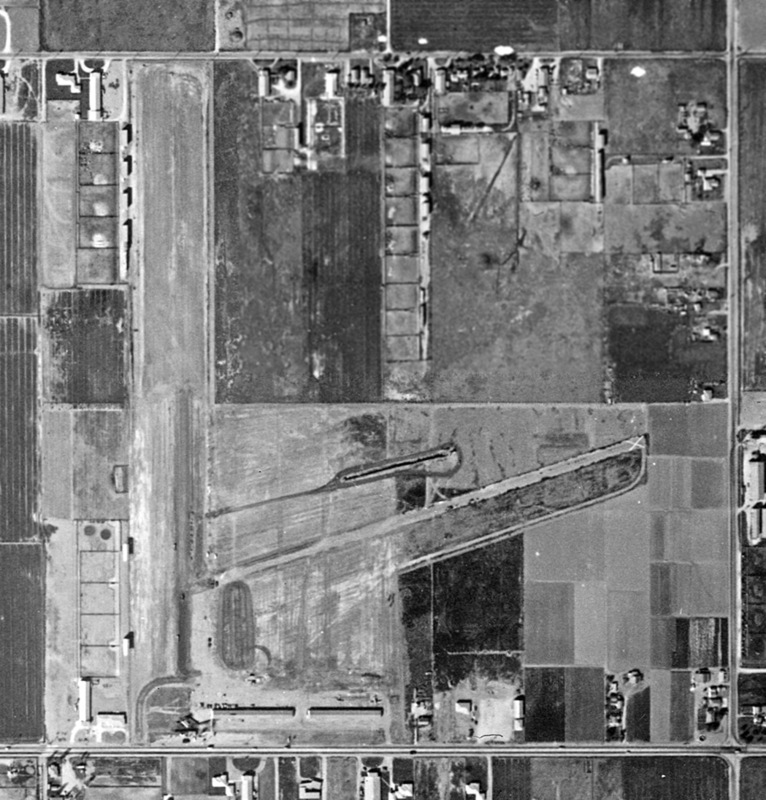 The earliest photo of North Torrance Airport which has been located was a 9/4/46 aerial view (courtesy of Jim Osborne). along with paved taxiways, several ramps, and a hangar on the northeast side. Two dozen aircraft were visible on the field. who trained students using Aeronca Champion 7-AC aircraft. plus a small restaurant that was more like a lunch counter. The runway departure flight path crossed over the Flying Fryers Ranch which was a turkey ranch at the west end of the airport. The birds were frequently scared by low-flying aircraft. 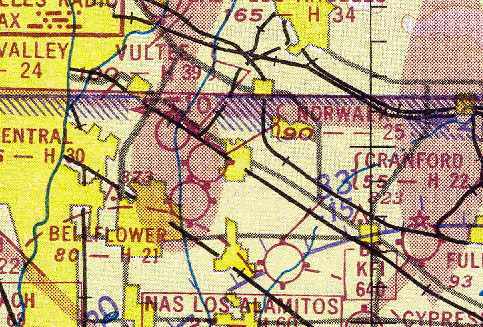 The 1946 USGS map depicted the field as Torrance Community Airport. 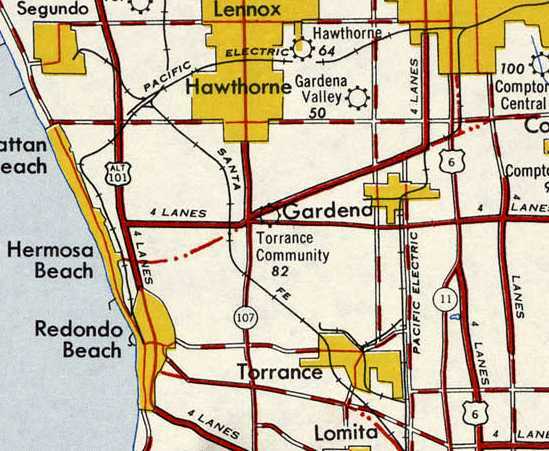 It depicted Torrance as a commercial/municipal airport. 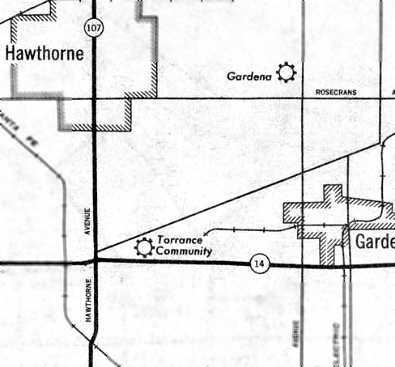 A 1947 USGS map depicted the Torrance Community Airport. Over 40 light aircraft were visible on the field. 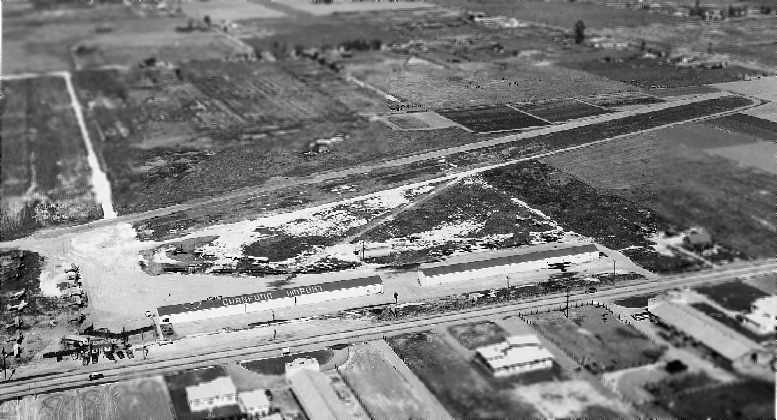 A circa 1948 photo of Bay Cities Airport (courtesy of Dave Pierson via Jim Osborne). Standing in front of a Vultee BT-13 are Frank Shatz, Dave Pierson, Bert Bender, Jack Locke, Norm Peterson. In the background at left can be seen the hangar of B&G Air Service. Former Lawndale resident Richard Meyer also recalled the airport. that was located on the northeast corner of Hawthorne Boulevard & Redondo Beach Boulevard. The owners of the planes would tell us kids that they would pay us to wash the planes. An undated (circa late 1940s?) photo of Bay Cities Airport (courtesy of Chuck Livergood via Jim Osborne). Ray Wolsky (co-owner of Bay Cities shop), and 3 unidentified men. Kneeling are: Ed Williams, and Chuck Livergood (co-owner of Bay Cities shop). Roger Keeney, owner of Acme Aircraft, recalled, “I remember Bay Cities well. A circa 1948 photo of Bay Cities Airport (courtesy of Jim Osborne). 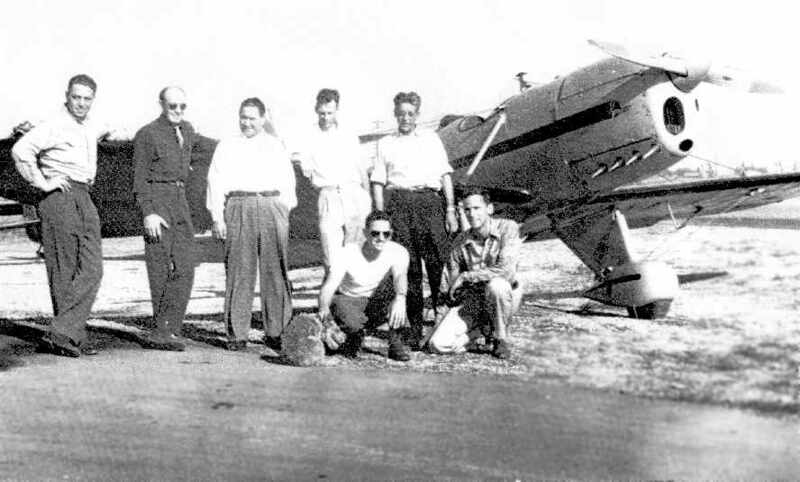 Gathered in front of the aircraft are Dave Pierson, Frank Shatz, Bert Bender, Jack Locke, Norm Peterson. was on the February 1949 LA Sectional Chart (courtesy of Chris Kennedy). 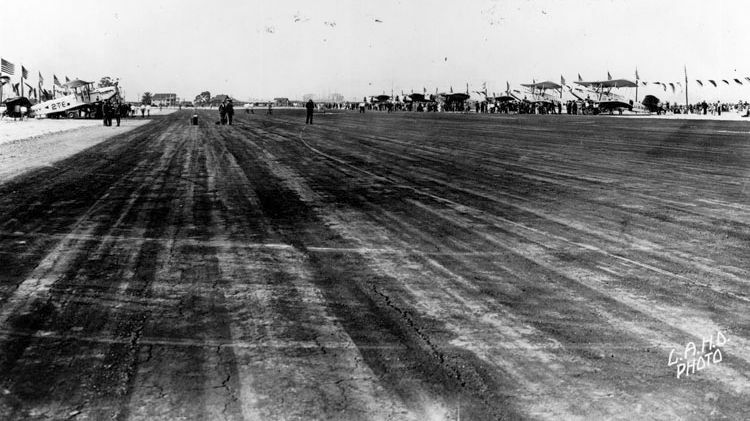 It depicted Torrance as having a 2,100' paved runway. 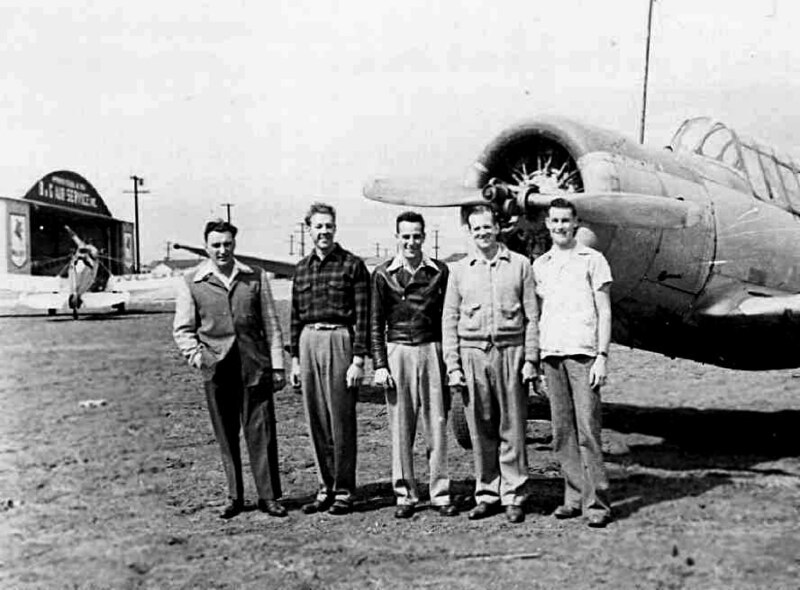 Chuck Liverwood & his partner Ray Wolsky operated an aircraft & engine shop about 1950 at Bay Cities. depicted Bay Cities Airport as having a 2,400' paved runway. 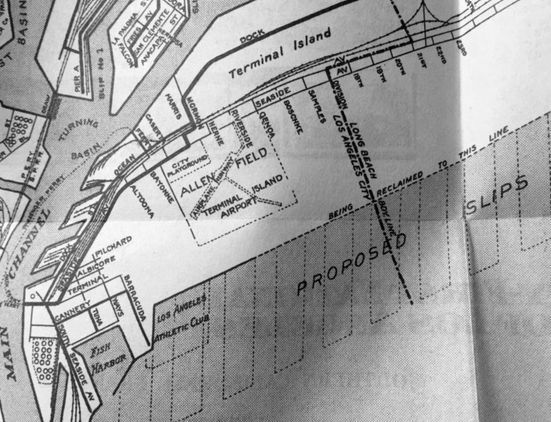 The 1950 USGS topo map depicted Bay Cities Airport as an open area with several buildings along the west & south sides. 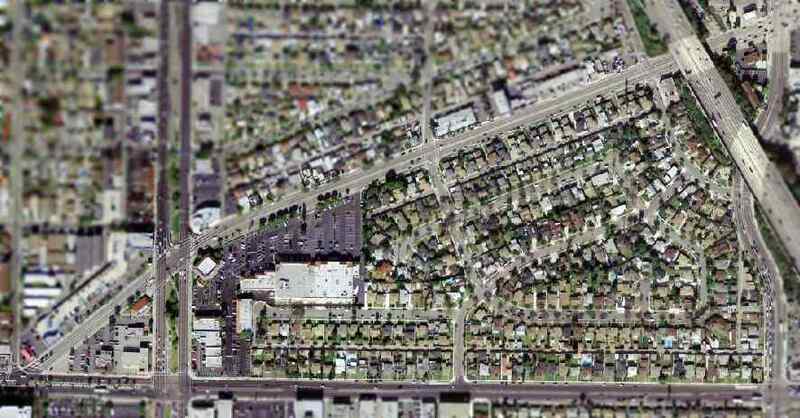 as being located southeast of the intersection of Redondo Beach Boulevard & Freeman Avenue. It depicted a single building on the northeast corner of the property. as it was no longer depicted on the March 1951 San Diego Sectional Chart (according to Chris Kennedy). Jim Osborne continued, “Sadly, the Bay Cities Airport proved to be short-lived. In all, it operated less than 5 years. using the long runway as a drag strip to race their hot rods. and remembers a fatal crash that resulted in the shutting down of the racing at the former airport by the local authorities. By 1951, new home construction had begun on the former airstrip land. with not a trace remaining of the former Bay Cities Airport. and people were always confused as to how the lumber yard got its name because it was so far from the Los Angeles Airport. with not a trace appearing to remain of the former airport. 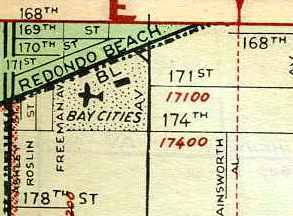 The site of Bay Cities Airport is located southeast of the intersection of Redondo Beach Boulevard & Freeman Avenue. Thanks to Jim Osborne for pointing out this airfield. 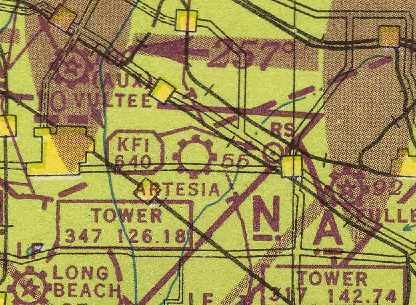 Artesia Airport, as depicted on the February 1946 San Diego Sectional Chart (courtesy of Chris Kennedy). as it was not yet depicted at all on the August 1945 San Diego Sectional Chart (according to Chris Kennedy). was on the February 1946 San Diego Sectional Chart (courtesy of Chris Kennedy). 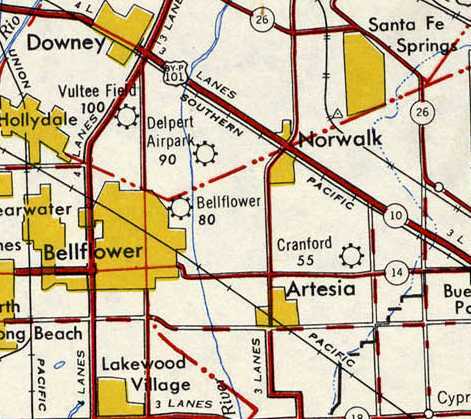 It depicted Artesia Airport as a commercial or municipal field. 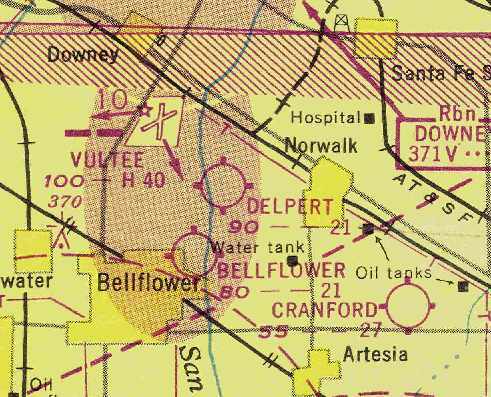 described “Artesia Airport” as being renamed “Cranford Airport”, as of 6/18/46. 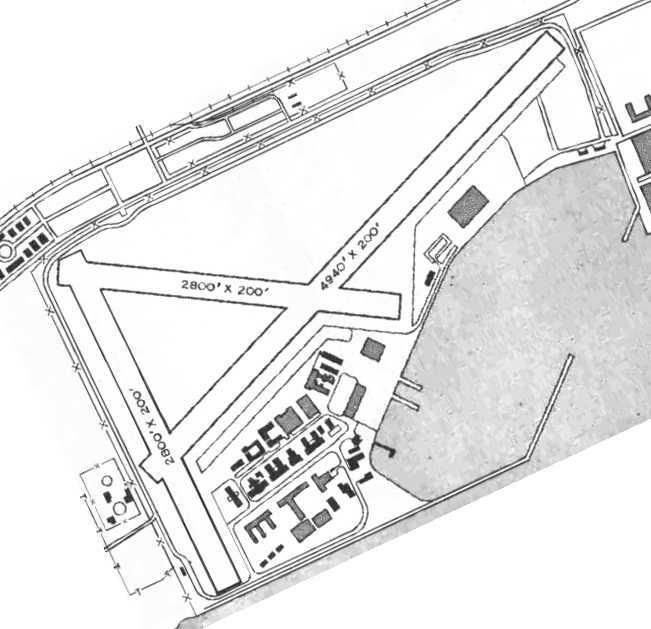 Cranford Airport, as depicted on the 1946 USGS topo map. 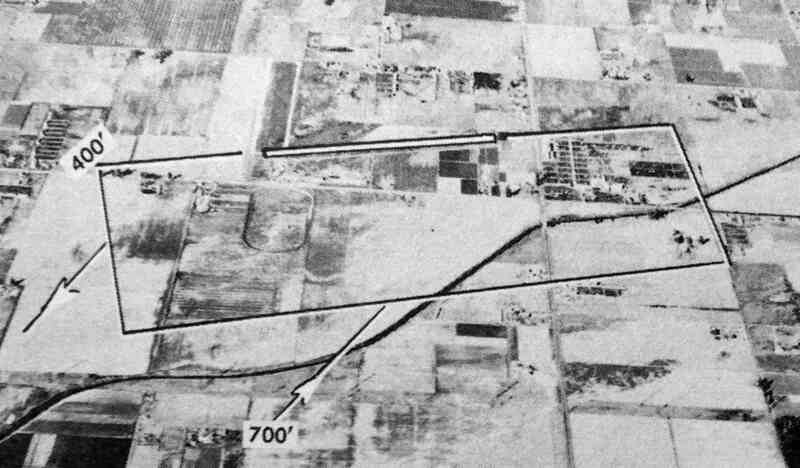 The earliest depiction which has been located of Cranford Airport was a 6/18/47 USGS aerial view (from the UCSB Library). 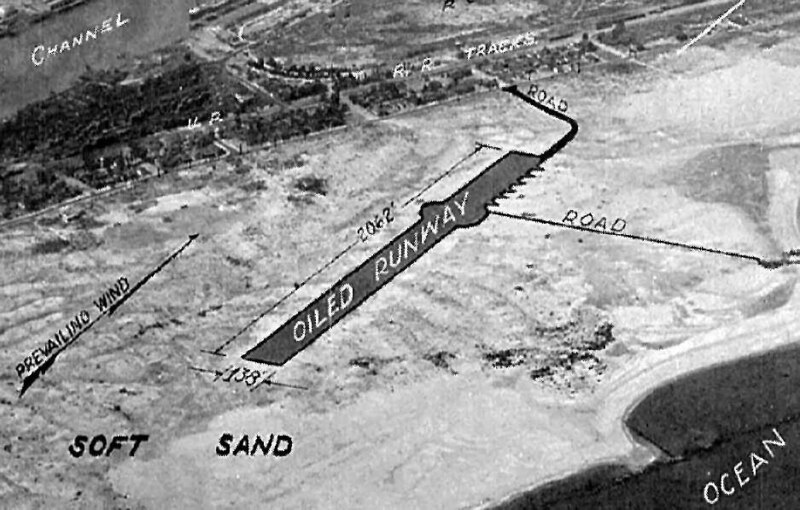 It depicted Cranford as having 2 paved runways, each with a parallel taxiway. A few dozen light aicraft were parked on the south side of the field. described Cranford Airport as having a 2,700' unpaved runway. one oriented north/south & the other northeast/southwest. and a ramp along the south side of the field had 2 buildings (hangars?). and his wife [Fanny Alley] purchased the Cranford airport sometime in the years following WW2 as a real estate investment." An undated aerial view looking north at Cranford Airport from the 1950 Air Photo Guide (courtesy of Kevin Walsh). The guide described Cranford Airport as having a 2,500' paved northeast/southwest runway & a 2,500' dirt north/south runway. It listed the manager as George Owens. depicted Cranford as having a 2,200' hard surface runway. A 1952 aerial view depicted Cranford Airport as having 2 runways, one oriented north/south & the other northeast/southwest. Each runway had a parallel taxiway, and a ramp along the south side of the field had 2 hangars. A dozen light aircraft were parked on the southwest side of the field. depicted the field as having a paved east/west runway, along with an unpaved north/south strip. and a number of small aircraft were visible on the southwest corner of the field. and the eastern portion of the runway was marked with a closed-runway “X” symbol. One or possibly 2 light single-engine aircraft were still visible parked north of the runways on the south side, perhaps stranded after the airport's closure. 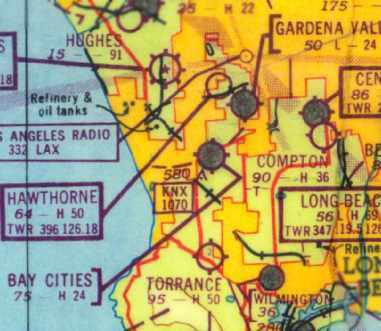 Cranford Airport was no longer depicted on the September 1954 San Diego Sectional Chart (courtesy of Chris Kennedy). It was evidently a very short-lived airfield, only lasting no more than 9 years. 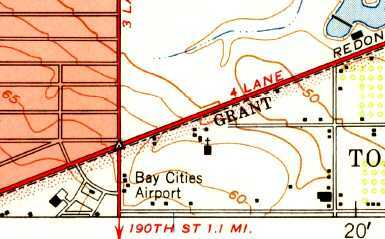 Cranford Airport was not depicted at all on the 1964 USGS topo map. 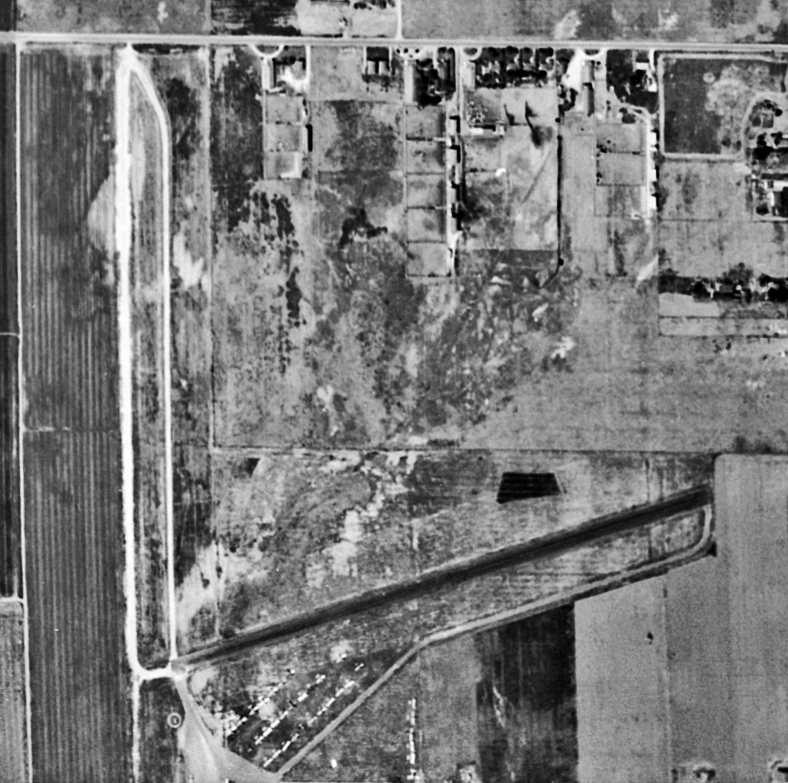 A 1972 aerial view showed no trace of the airport, with dense housing having covered the site. the former northeast/southwest runway appears to have remained intact. which has been built along the southern portion of the former airport site. of the intersection of Orangethorpe Avenue & Carmentia Avenue. 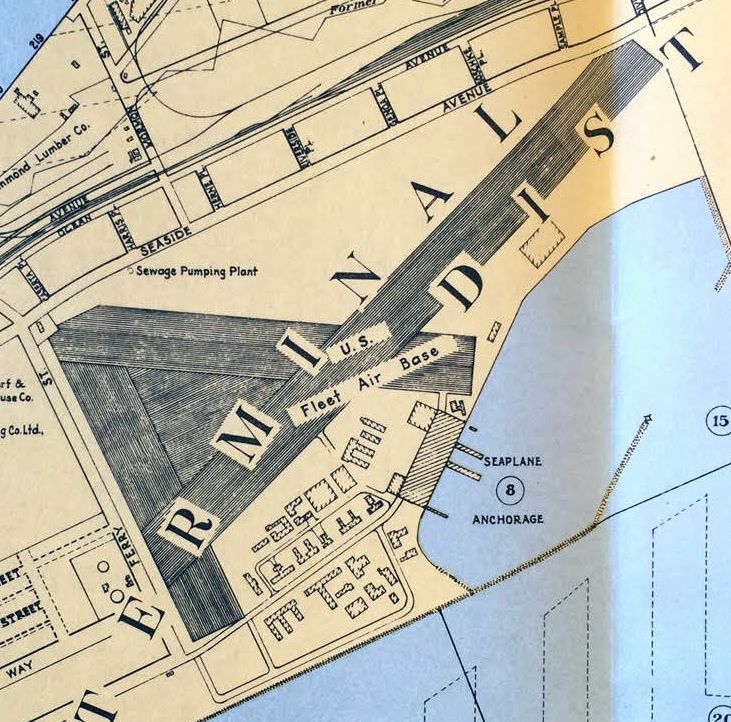 “Allen Field Terminal Island Airport” as depicted on a circa 1927-28 Security Bank map (courtesy of Kevin Walsh). 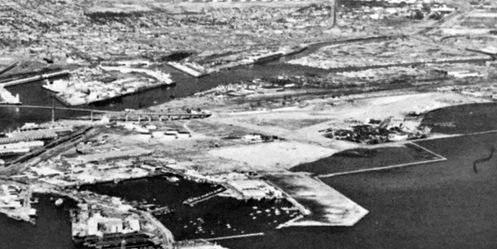 This former military airfield was located on Terminal Island, a sand-filled island in Long Beach Harbor. 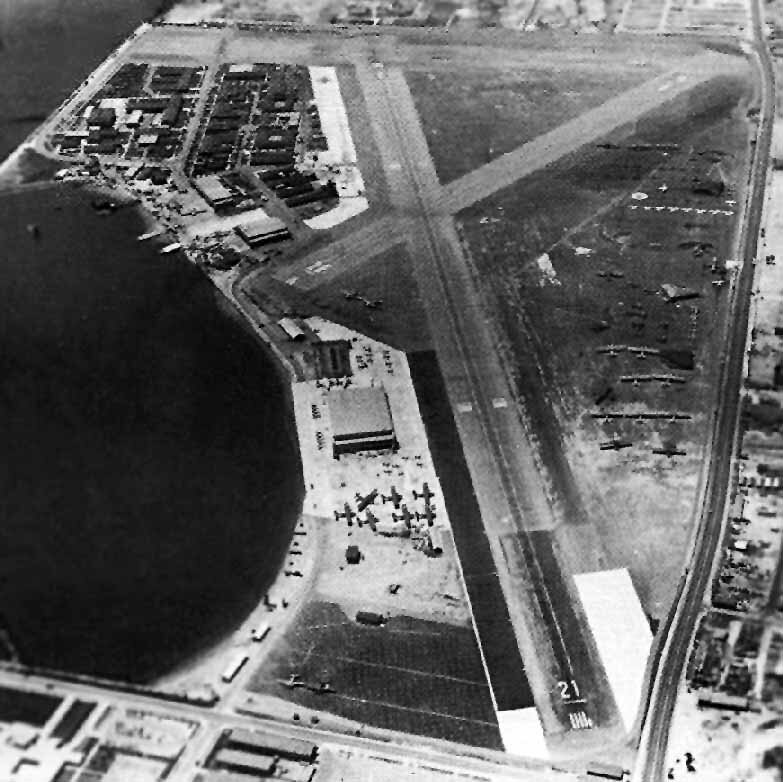 The airfield was adjacent to the former Long Beach Naval Station. a civilian airfield, Allen Field, was first established on this site in 1927. 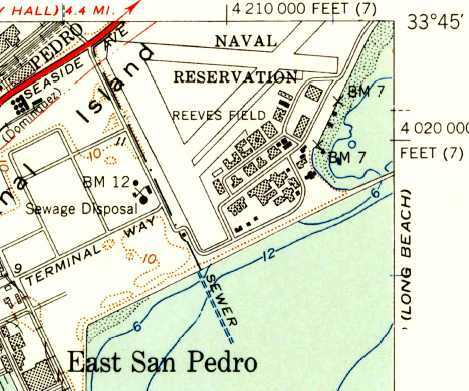 The Naval Reserve established a training center at the San Pedro airfield in 1927. The earliest depiction which has been located of Allen Field was on a circa 1927-28 Security Bank map (courtesy of Kevin Walsh). within which was a small northeast/southwest runway, and a taxiway leading toward the southeast. 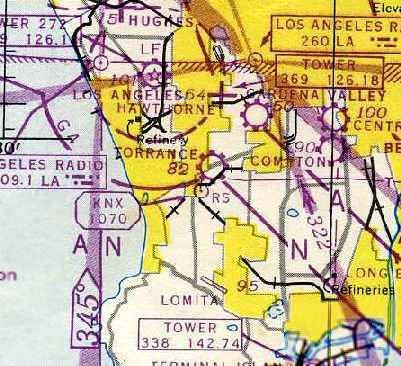 was on the 1929 LA – Las Vegas Air Navigation Map #132.
and a 200' seaplane launch way. from the Richfield Oil Company's 1929 "California Airports" directory (courtesy of Jonathan Westerling). but not having any other facilities. 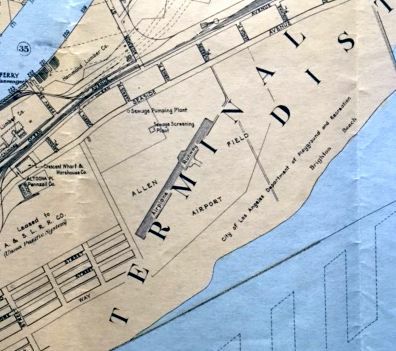 “Allen Field Airport” as depicted on a 1932 map (courtesy of Kevin Walsh). 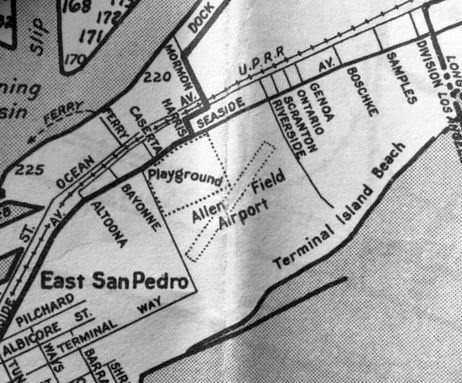 Allen Field was depicted as an auxiliary airfield on the 1934 San Diego Airway Chart (courtesy of Roger Connor). 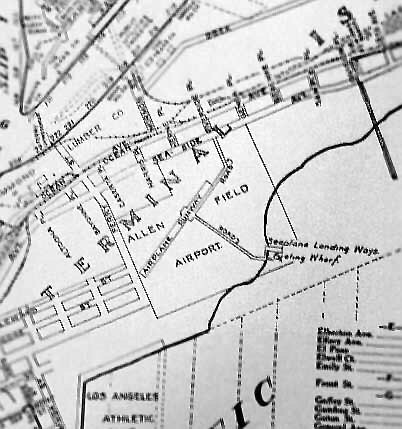 “Allen Field Airport” was depicted on a 1935 Security Bank map (courtesy of Kevin Walsh) as having a northeast/southwest runway. The Naval Reserve took complete control of Allen Field in 1935. 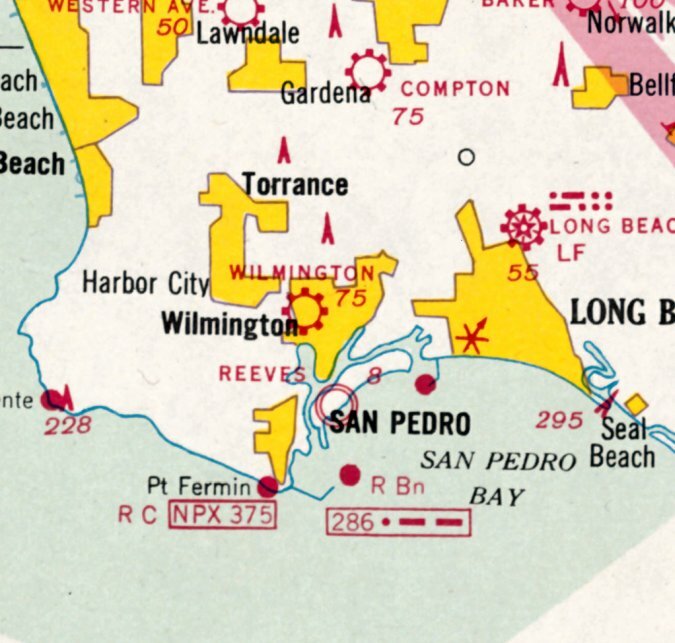 In 1936 the field was designated Naval Air Base San Pedro, Reeves Field. An undated photo of Martin T3M-1 Torpedo bombers lined up along the runway of Allen Field on Terminal Island (from the LA Public Library). described Reeves-Navy airfield as having a single 2,000' oiled runway. 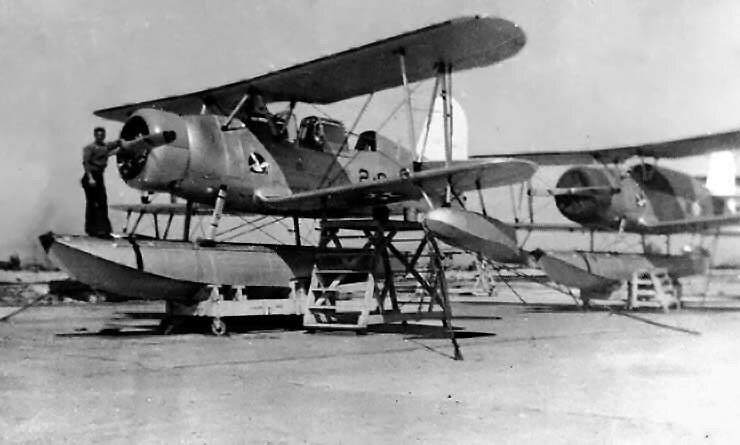 A 1938 U.S. Navy photo of SOC-3 Seagull floatplanes of Observation Squadron Two parked at Reeves Field. 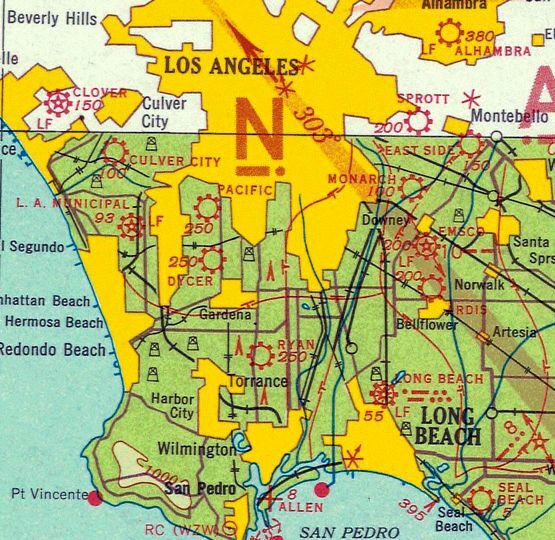 The 1939 LA County Airports Map depicted Reeves Field as having 3 runways. A 10/16/39 USGS aerial view (from the UCSB Library) depicted Reeves Field in its expanded configuration, with 3 paved runways. 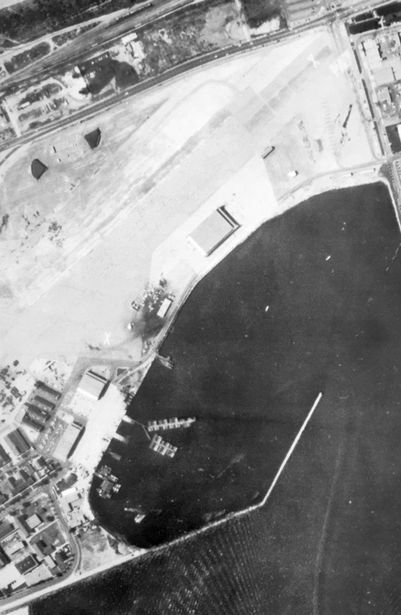 A closeup from the 10/16/39 USGS aerial view (from the UCSB Library) depicted a variety of single-engine biplanes on the southern Reeves Field ramp. 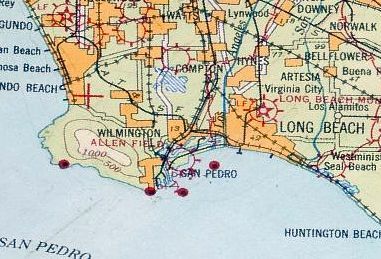 San Pedro NAS, as depicted on the 1941 LA Sectional Chart (courtesy of Chris Kennedy). Frank Harris recalled, “P-38's... were at Reeves Field on Terminal Island & were in concrete bunkers with high walls. with a road loading toward “Seaplane Landing Ways” on the southeast side of the field. 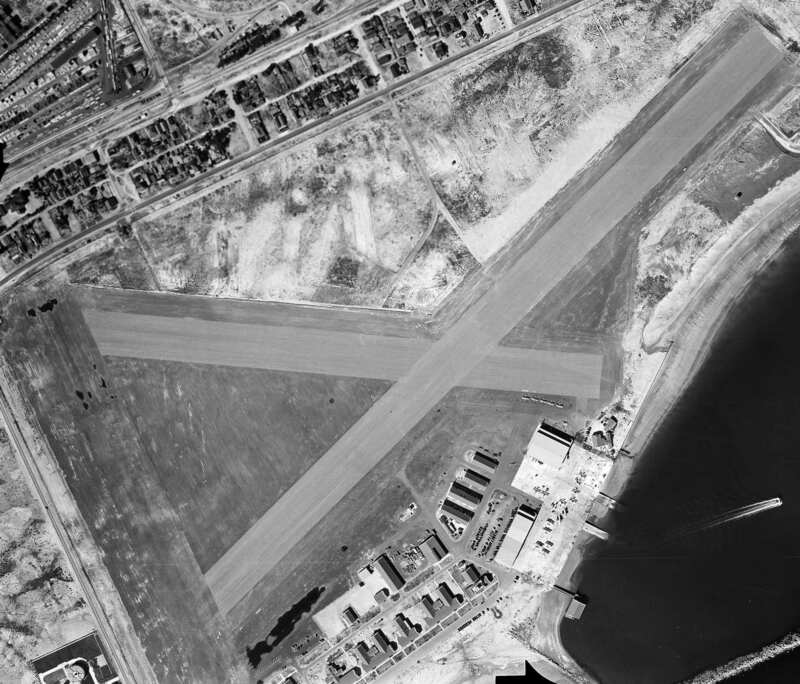 It was redesignated Naval Air Base Terminal Island is 1942.
a large seaplane ramp, and several hangars & other buildings. A rare 1945 U.S. Navy photo of a factory-fresh Boeing-built PB2B-2 Catalina landing in Long Beach Harbor at NAS San Pedro (courtesy of John Voss). John Voss noted, “It was built of the Royal Australian Air Force. Boeing finished the aircraft in standard RAF Coastal Command colours with the RAF S/N of JX661. It was eventually assigned the RAAF S/N of A24-350 & would be entirely repainted in O/A black for the 'Black Cat' operations. for seaplanes assigned to ships of the Pacific Fleet. of aircraft produced at the nearby plants of Lockheed, Douglas & Vultee. as having a 4,900' hard-surface runway. A 9/8/44 USGS aerial view (from the UCSB Library) displayed an amazing variety of aircraft at Reeves Field. 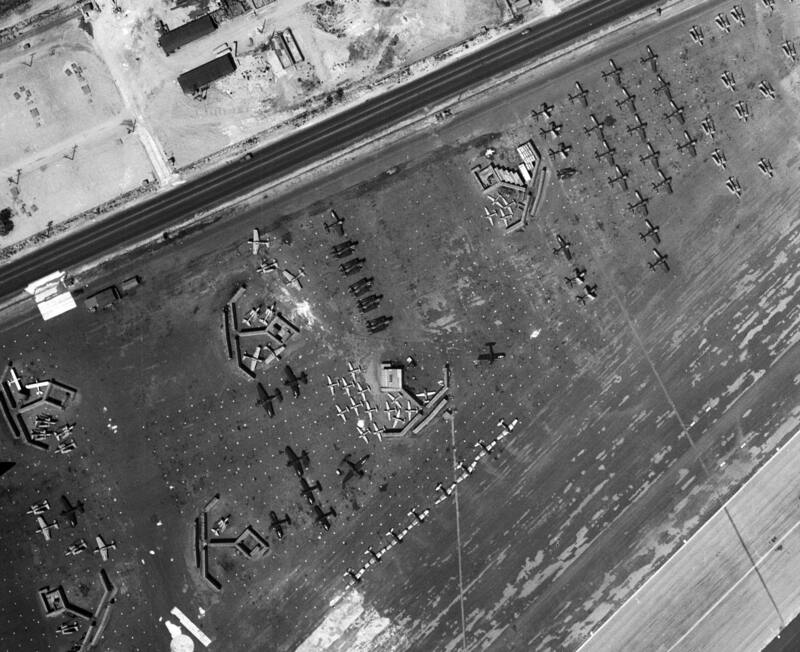 A closeup from the 9/8/44 USGS aerial view (from the UCSB Library) displayed an amazing variety of aircraft at Reeves Field. 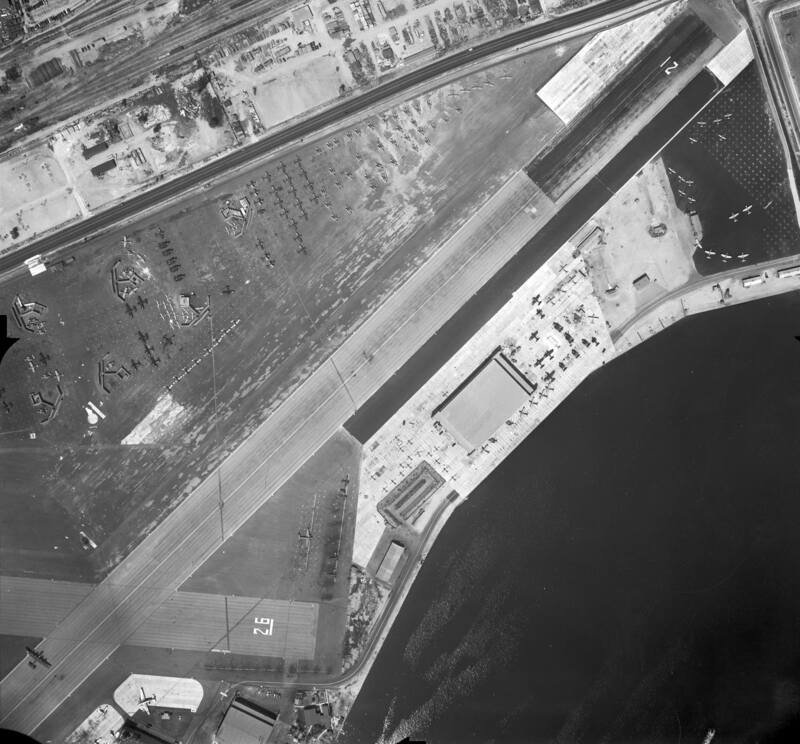 A 1945 aerial view looking southwest at NAS Terminal Island (National Archives photo). 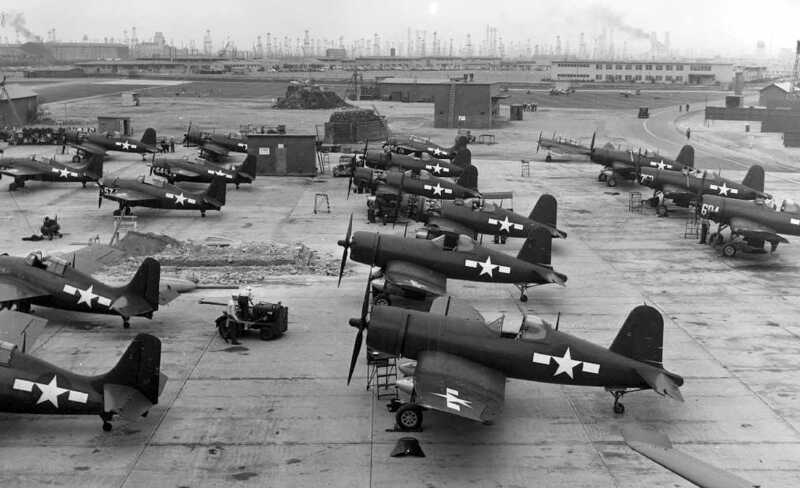 showing a number of ‘factory fresh” FM-2 Wildcats, F4U Corsairs and one tri-colored Curtiss SNC. as a 334 acre rectangular property within which were 3 asphaltic concrete runways, the longest being the 4,940' northeast/southwest strip. to be owned by the City of Los Angeles, and operated by the Navy. A map of Reeves Field by Richard Landgraff, author of a book on the history of Long Beach Naval Shipyard. 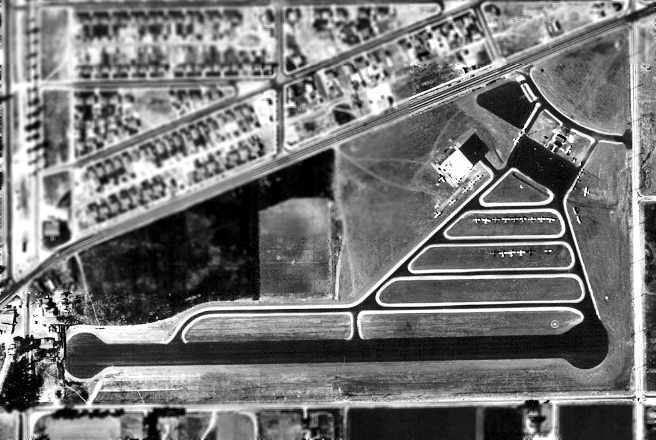 A 1947 aerial view looking northeast at Reeves Field, showing 3 paved runways & a hangar. depicted 3 runways, buildings, and the seaplane anchorage. 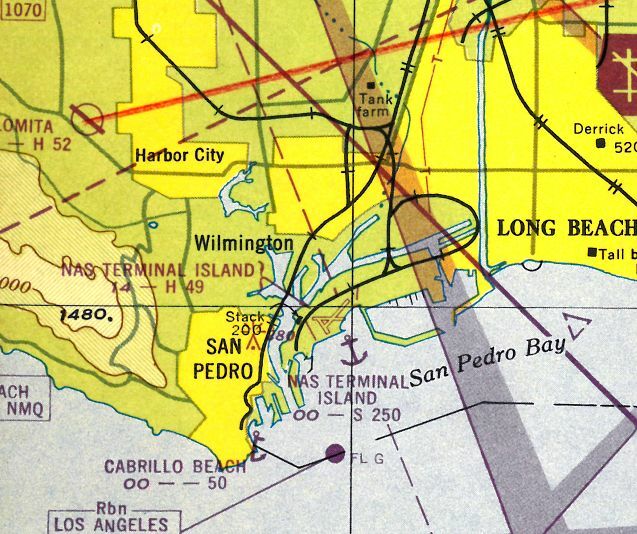 The 1947 LA Local Aeronautical Chart (courtesy of Tim Zukas) depicted NAS Terminal Island as having 3 paved runways, with the longest being 4,900'. 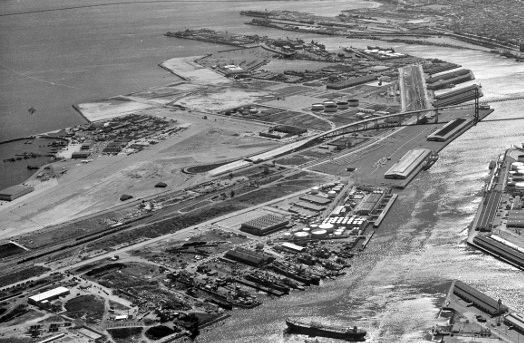 The Naval Air Station at Terminal Island was disestablished in 1947, with the airfield continuing in operation is a reduced status. 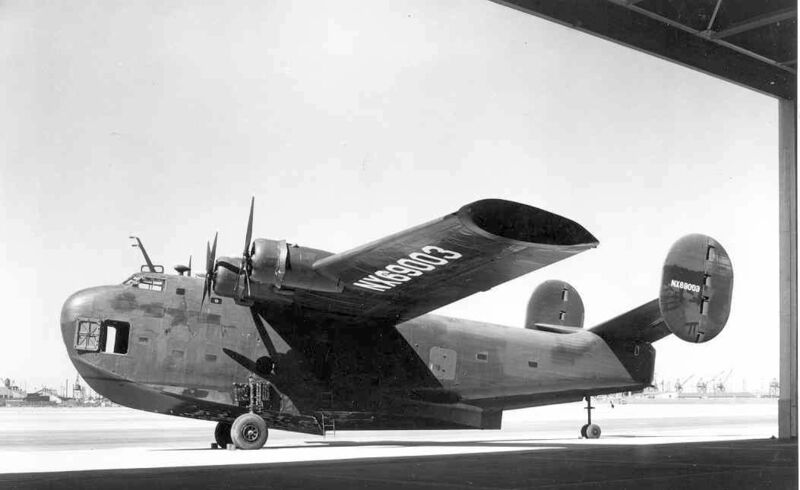 A circa late 1940s photo of a rare Consolidated PB2Y-5R Coronado in civilian markings, owned by Hughes Aircraft, evidently taken at Reeves Field. This aircraft, BuNo 7099, was stricken from the Navy inventory in August 1946 & then by Howard Hughes. He bought it to gain experience piloting a large flying boat, prior to his first flight of the massive Hughes HK-1 Hercules. 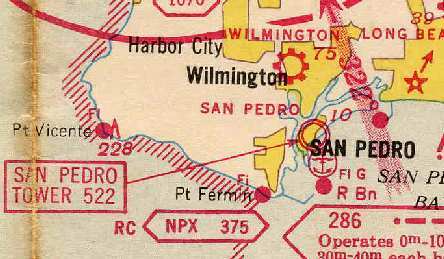 NAS Terminal Island was depicted as an active airfield on the 1949 San Diego Sectional Chart (according to Chris Kennedy). The 1951 USGS topo map depicted Reeves Field as having 3 paved runways. 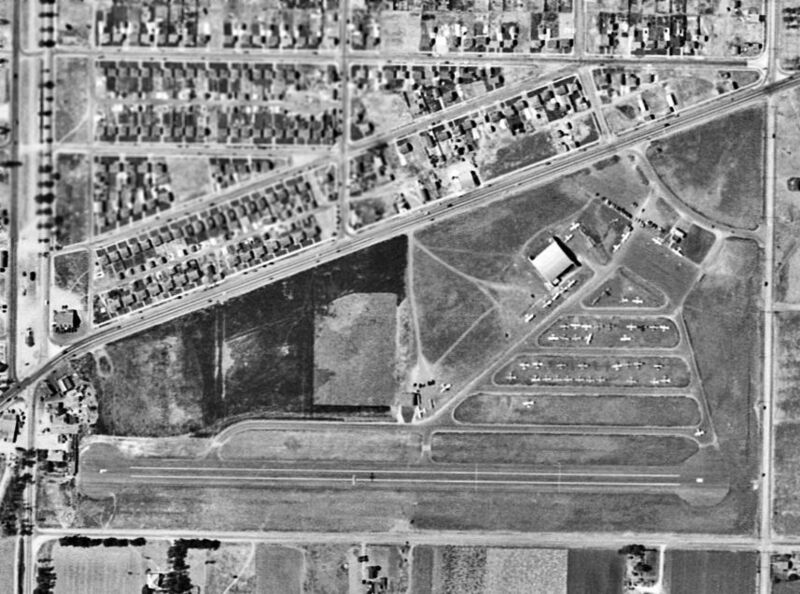 The last photo which has been located showing the runways of Reeves Field remaining intact was a 1952 aerial view. The field consisted of 3 paved runways, with several hangars & other buildings along the south side. 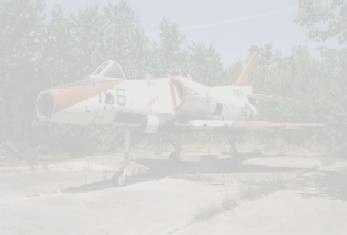 No aircraft were visible on the property. 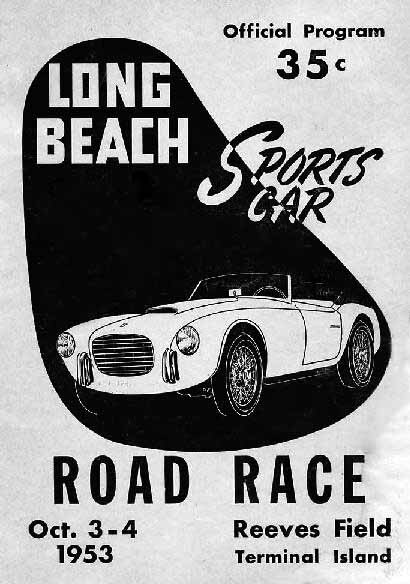 The program cover for the “Long Beach Sports Car Race”, held on Reeves Field on 10/3/53 (courtesy of Frank Sheffield). 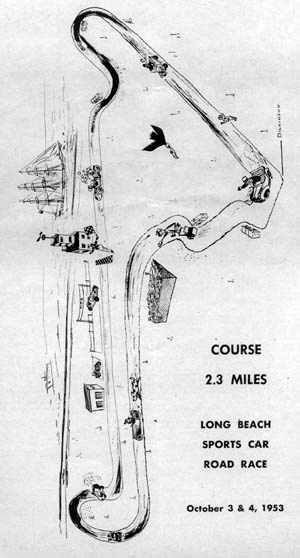 The race track layout for the “Long Beach Sports Car Race”, held on Reeves Field on 10/3/53 (courtesy of Frank Sheffield). and described as having a 4,900' hard surface runway. but the Aerodromes table described the field as "Navy. Closed. Inactive." The airfield was described as consisting of a 3 bituminous runways (the longest being 4,940'). 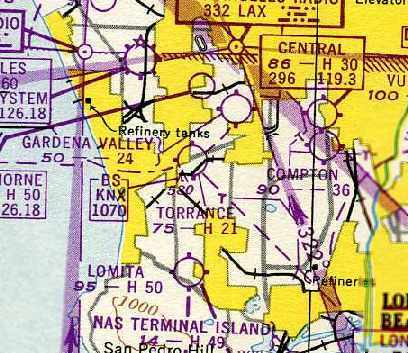 By the time of the 1960 LA Local Area aeronautical chart, Terminal Island was labeled as "Abandoned airport". 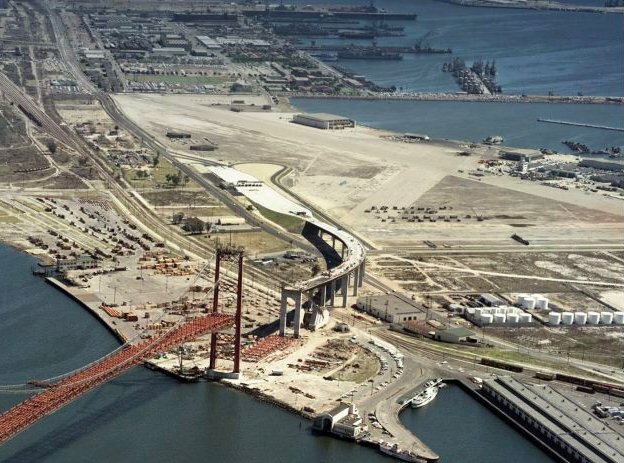 A 1963 aerial view looking south at the Vincent Thomas bridge under construction, with Reeves Field visible in the background (courtesy of Kevin Walsh). An undated aerial view looking north at Reeves Field from the March 1966 Southern CA Traveler (courtesy of Kevin Walsh). but the majority of the runways, hangars, and other airfield facilities remained intact. and was used for some time afterward to store imported automobiles. a local strip where street folks could come down & race in a legal, non-dangerous way. I used to shoot video down there for a friend." A June 1975 photo by Mark Morgan of the Consolidated PB2Y-3 sitting alone on the Reeves Field ramp. Mark recalled, “I did 1st Class Cruise (summer 1975) out of NAVSTA Long Beach. I meandered on over with my camera, stumbled across this HUGE flying boat, 4 engines, really bad shape, didn't have a clue what it was. 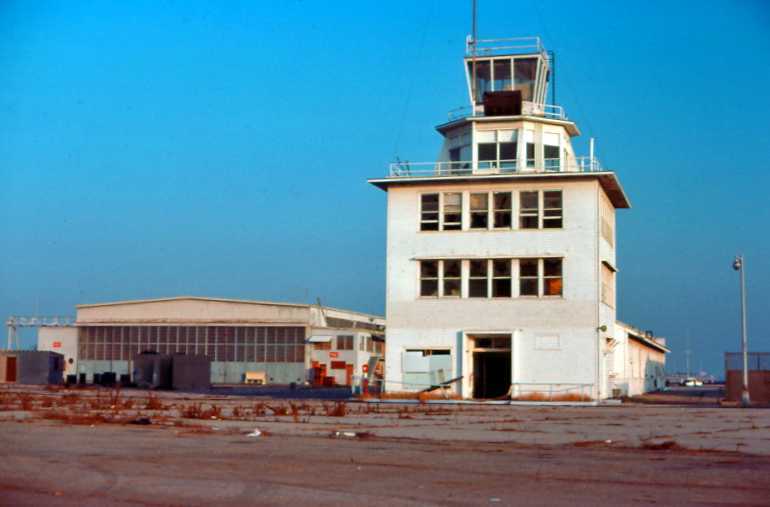 A circa 1975-76 photo by Jim Babin of the San Pedro control tower & a hangar. 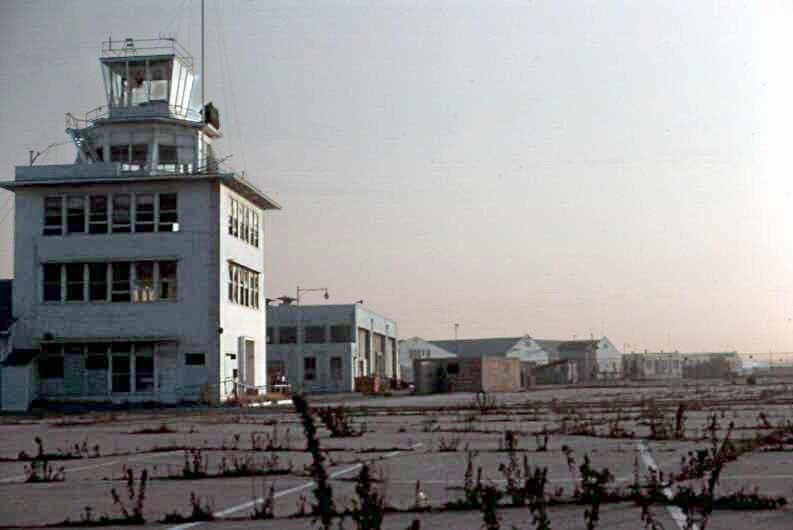 A circa 1975-76 photo by Jim Babin of the San Pedro control tower & several hangars. with a sole aircraft still present, a rare Consolidated PB2Y Coronado flying boat. 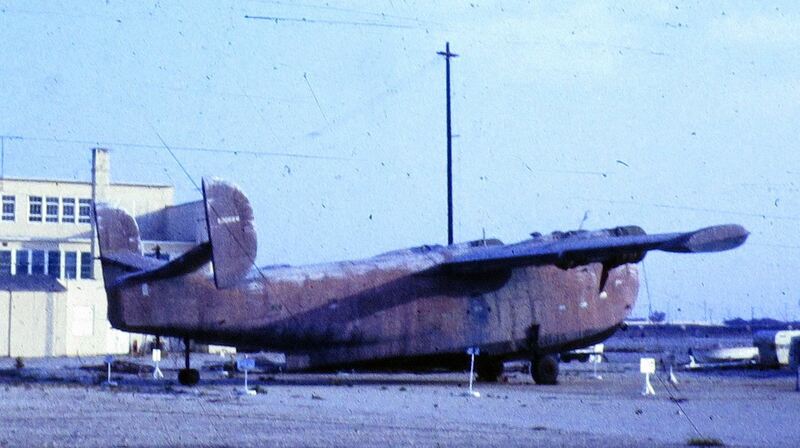 A circa 1975-76 photo by Jim Babin of Consolidated PB2Y Coronado flying boat on the San Pedro ramp. John Snapp recalled, “The Brotherhood Raceway Park actually opened in December 1976. 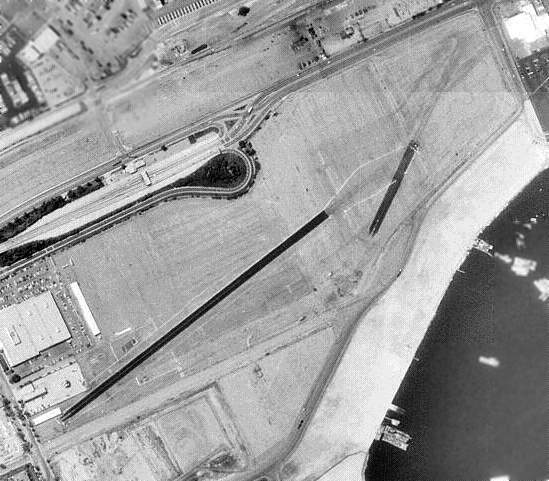 A 1980 aerial view showed that 3 large hangars still remained standing on the south side of the former Terminal Island airfield. and a majority of the runways had been covered by other construction. and what appears to be the Consolidated PB2Y Coronado flying boat still parked next to the hangars. John Snapp recalled, “It was used for drag-racing until 1984.
they were only allowed so many race dates per year. 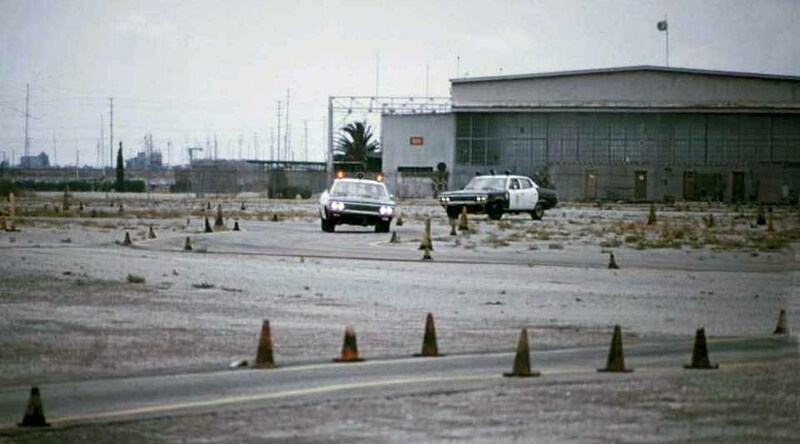 In the 1994 USGS aerial photo, the asphalt strips that look like runways were built for vehicle testing by UCLA & police training, not for aircraft. Landgraff notes, "If you look closely at the northeast end, you can see a discoloration of the ground that was the original Runway 21. To the right is the new Naval Reserve Center which now sits over the very end of the original runway." The former hangars had also been removed at some point between 1980-94. 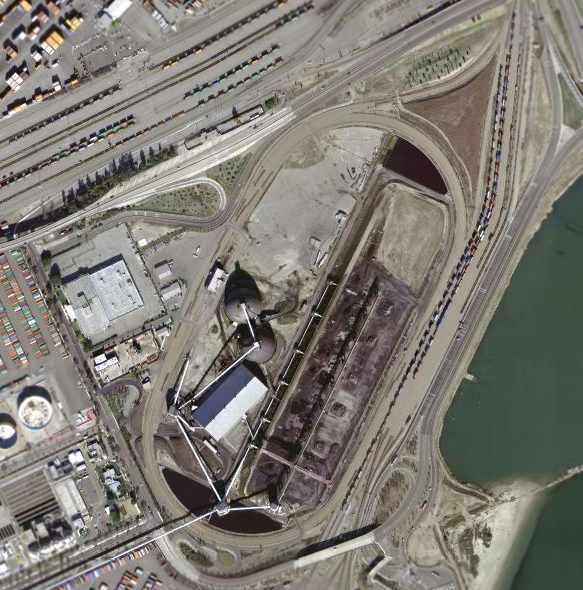 As seen in the March 2004 USGS aerial photo, a large industrial facility now covers the site of Reeves Field. 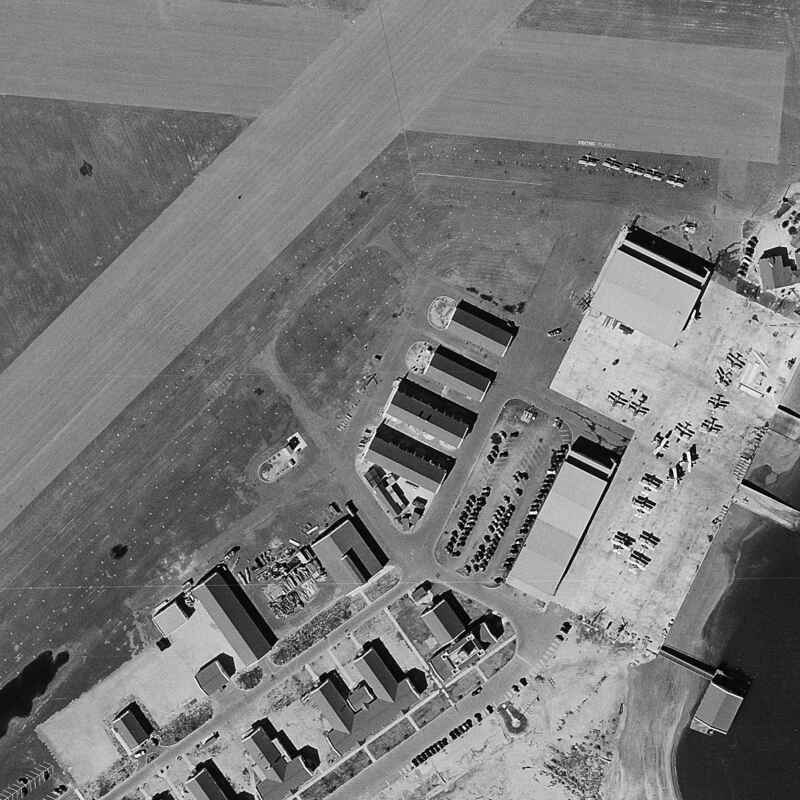 The only trace which appears to remain of the Naval Air Station is a single seaplane ramp leading down into the water.